As soon as the ball left the clubface I knew it was going to be good. Over the ball I felt relaxed and confident. The hole, one of the prettiest in Jasper, measured 140 yards; a smooth 9-iron for me. Sure enough, the ball never left the flag. It took one hop straight towards the hole and disappeared. “It’s in!” screamed one of the guys in my group. I wasn’t so sure. After all, on my golf junket along the famous Yellowhead Highway, I had already been rewarded plenty! From Portage la Prairie, Manitoba to Masset, British Columbia, the Yellowhead Highway is a 2,960 km long ribbon of road that cruises east/west through some of the prettiest terrain in Canada. Along the way is every type of landscape, every form of idyllic Canadian beauty imaginable. From majestic, wide-open prairie scenes to sparkling lakes and snow-capped mountains exploding into baby blue skies, it’s all there. It’s a wonderfully scenic highway that, like the famous Trans Canada, is one of our most recognizable routes. For golfers, the Yellowhead Highway affords an exceptional journey. True, it’s too long, too logistically challenging, to tackle all at once. Unless, of course, you’ve got an entire summer – and then some! – devoted to the task. After all, there are over a hundred courses that are on, or in very close proximity, to the highway. However, done in stages, in bite-size chunks, and it could easily be considered one of the best golf opportunities in the country. There are a few specific areas along the way that are of particular interest for golfers. These are areas that boast multiple courses of excellent quality as well as the necessary add-ons – ie: great hotels, restaurants, and attractions – that make for an outstanding golf holiday. These notable golf-rich areas along the Yellowhead are: Kamloops, Edmonton, Prince George, and Jasper. In the last three years I’ve embarked on four separate golf trips to each of these destinations along the Yellowhead Highway. Although it’s tough to pick a favourite, each trip I’ve taken has been rewarding in its own way and comes highly recommended. 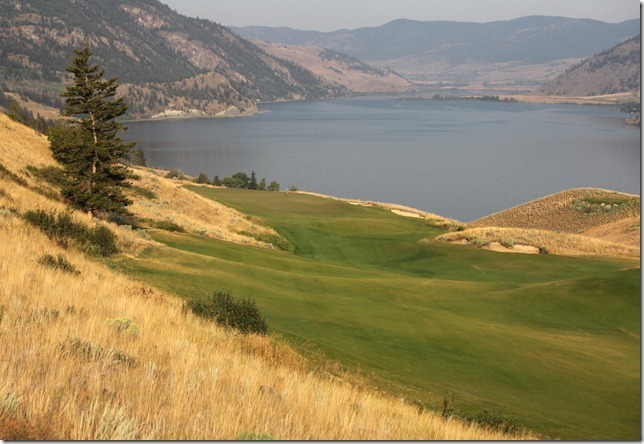 Unquestionably, one of my favourite golf destinations in Western Canada is Kamloops. Blessed with a beautiful climate – if you like it hot and dry, it doesn’t get better! – and a handful of incredibly scenic golf courses, the Kamloops region is a world-class golf destination by every account. There are at least six golf courses here that comfortably qualify for “must play” status. The six courses are: Rivershore, The Dunes, SunPeaks, SunRivers, Tobiano, and Sagebrush (located near Merritt). One of the major reasons why the Kamloops region is so enticing and rewarding is the stunning look and feel of this desert-like terrain. It’s golf in the rolling, cacti-peppered hills of the Canadian “wild west.” And it works like a charm! Perhaps the best example of this is Tobiano. A riveting, albeit very difficult, Thomas McBroom design, Tobiano is an unforgettable roller-coaster ride high on an exposed bluff above KamloopsLake. Besides the jaw-dropping vistas, the course features a number of “infinity” greens that appear suspended above the lake as well as numerous holes that careen through coulees and tumble down the hillsides. From a visual perspective, golf doesn’t get any more dramatic than this. As the largest city on the Yellowhead Highway, it should come as no surprise that the Edmonton area is home to the highest concentration of golf courses on the trail. The variety here is definitely worth noting. From prairie gems like The Legends and The Ranch to parkland beauties like Northern Bear and Cougar Creek, the golf scene in Alberta’s capital is rich, to say the least. If you can score a tee time at one of the many outstanding private courses such as Blackhawk, Royal Mayfair, or Glendale, for example, all the better! Suffice it to say, it will take you a long time just to scratch the surface here. Even though I’ve yet to play many of the courses, I consider Edmonton one of the best golf cities in Canada. The northern outpost of Prince George (525 km north of Kamloops) is also surprisingly strong when it comes to golf. Built in 1999 during the big golf boom, Aberdeen Glen is definitely the trump card here. The first and only time I played it (three years ago), I was blown away by the quality, conditioning, and overall merit of this course. The layout, which is routed through nature (not houses! ), boasts wonderful elevation changes and a super-challenging collection of holes. 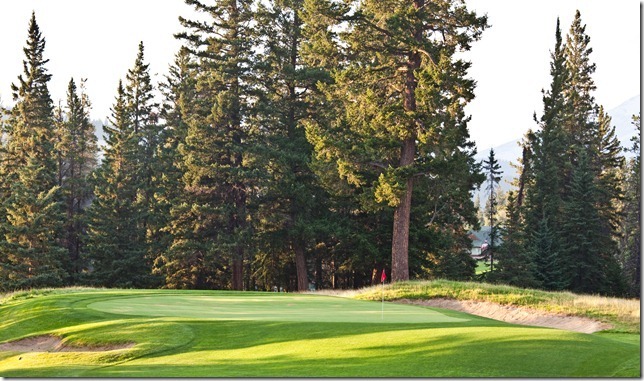 The two other courses you’ll want to play in this area are the Prince George Golf & Country Club (unfortunately, they lost many of their trees a few years back to the pine beetle infestation) and Aspen Grove, a player-friendly, family-run course that seems to hit all the right notes. Although the historic Fairmont Jasper Park Lodge Golf Course is the only track in town, it’s certainly strong enough to make Jasper one of the best golf stops on the Yellowhead. (If you’re coming via Edmonton, a game at the Hinton Golf Club is mandatory!). Built in 1925 and designed by Canada’s greatest golf course architect of all time, Stanley Thompson, the Fairmont Jasper Park Lodge is a true masterpiece. The course, while not overly difficult by contemporary standards, oozes with history and charm. The par-3 holes are especially amazing. Long story short, resort golf just doesn’t get any better…anywhere. Last summer, on my last round on my Yellowhead golf junket, I had the distinct pleasure of playing Jasper with my “A” game intact. Believe me, it doesn’t happen often. On the par-3 15th – dubbed “Bad Baby” for its evil slopes around the green – I flagged my shot and, figuring the ball was in the hole, we quickly rushed to the green. Expecting to pick the ball out of the hole I was dismayed to find the cup…empty. “What the heck?” said one of the guys. “I thought that went in!” Then I glanced over the nasty ridge that guards the front right side of the green and saw my ball clutching the long grass by the bunker. “I guess it isn’t your day after all,” said one of the boys. However, with the kind of golf courses I’d been playing lately, I knew I had absolutely nothing to complain about.